They dropped a combined 299 pounds. Now these ‘Losers’ are keeping it off. Author’s note: Losing weight is challenging. Keeping it off can be even tougher. Being able to share these journeys with a twin brother helps, especially after millions of TV viewers witnessed your dramatic slimming. Here is their powerful, inspiring story, as first reported by American Heart Association News. They’re each other’s biggest cheerleaders and they also hold each other accountable if they don’t eat right or skip their workouts. They’ve come a long way in the last couple of years. Two years ago, the 38-year-old brothers from Cicero, Illinois, each weighed more than 300 pounds. They knew their weight was taking a toll on their health, but losing the pounds was a losing struggle. They tried many diets, but they never really worked. As physical education teachers, they said they felt like frauds telling their students to eat healthy and exercise. They used themselves as cautionary tales, warning the kids that if they didn’t take care of their health, they’d end up like them — obese and with serious medical problems. Roberto lost 160 pounds to win the grand prize of $250,000 in February 2016. Luis lost 139 pounds and won a $100,000 at-home prize. Since their appearance on the show, Luis and Roberto said they’ve worked hard at keeping the weight off and eating nutritious meals. Their perseverance has its rewards. They’ve competed in 5K runs, half marathons and triathlons. A few weeks ago, they participated in the Bank of America Chicago Marathon. Always athletes since they were young, the twins also said they’ve always had hearty appetites. They recalled that as children they had a terrible diet heavy on fried foods, tortillas and soda. Fruits and vegetables weren’t staples in their home. They continued eating poorly as adults and, eventually, it caught up with them, contributing to prediabetes and high blood pressure, which runs in their family. Conscious of what they say is their addiction to food, the brothers are now more mindful of how much they eat. Their wives make healthier versions of meat with chilis and other Mexican dishes of their childhood. The twins said they’re baking chicken, beef and other meats, have cut back on fried foods and eat vegetables with every meal. Planning meals in advance helps them stick to their healthy diets. But they do allow themselves a treat now and then. Luis and Roberto also made changes to their children’s diets and don’t let them eat as much junk food anymore. Their boys now want to eat healthy meals like their fathers. The brothers have been one another’s champions even when some family members were slow to support their new lifestyle. For instance, Roberto said their parents weren’t sold on their healthy eating habits. But now they have stopped urging them to eat seconds. The twins said their commitment has motivated an older brother to get fit. He has lost more than 20 pounds. For others that are struggling with their weight, Luis didn’t mince words. He cautions it is much easier to lose weight than to keep it off. Roberto also said the journey wouldn’t be easy, but that people who want to lose weight should set goals that work for them. 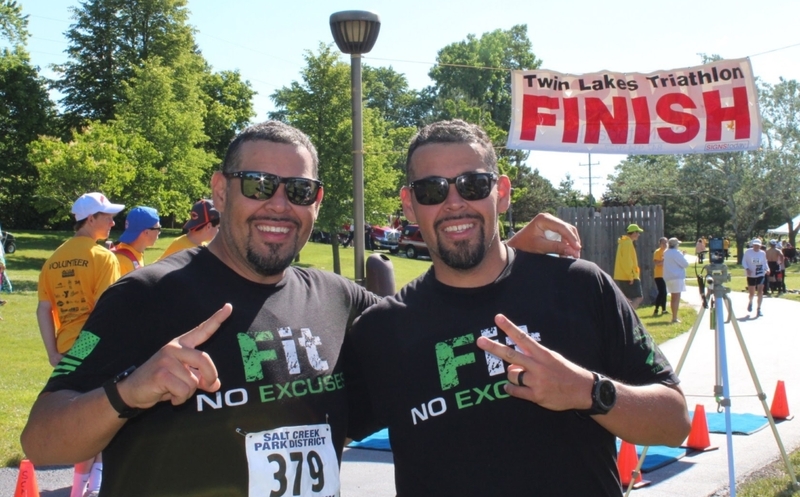 Luis and Roberto teamed with the AHA’s EmPOWERED To Serve movement to offer a series of at-home workout tips for Box Jumps, Donkey Kicks and Mountain Climbers.